IN an interview with reporters yesterday, Florida Governor Rick Scott was asked about his feelings about the state's policy on gay adoptions, which were just legalized after the court struck down a 30-year ban. Answered Scott: "I believe that adoption should be by a married couple." Scott's position has state advocacy groups very concerned. Obviously, this is an end-run around the courts on gay and lesbian inclusive adoption, it could remove millions of Floridians from the adoption process and leave tens of thousands of children in state foster care who could otherwise be adopted by loving families. The Governor’s statement was clear but it was not the only insight we learned. Such a narrow view of adoption is well outside the mainstream in Florida, leaves millions of Americans out of the process and disregards what is in the best interests of the child. It is, in a word, dangerous to have a man with these narrow values setting adoption policy for all of us. With this appointment and Governor Scott’s statement today, we are profoundly disappointed but not surprised. In real terms it means the showdown on adoption may be just starting instead of nearing an end. The Miami Herald adds: "Scott said he and Wilkins have not discussed whether to attempt to challenge an appeals court ruling from Miami-Dade that said the state law banning gays and lesbians from adopting is unconstitutional. Shortly after that ruling, DCF said it would no longer enforce the ban. 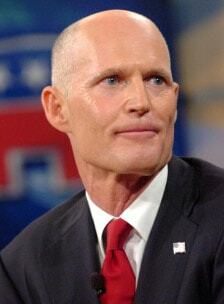 Scott spokesman Brian Burgess said the governor has no plans to revive the ban on gay adoptions at this time."